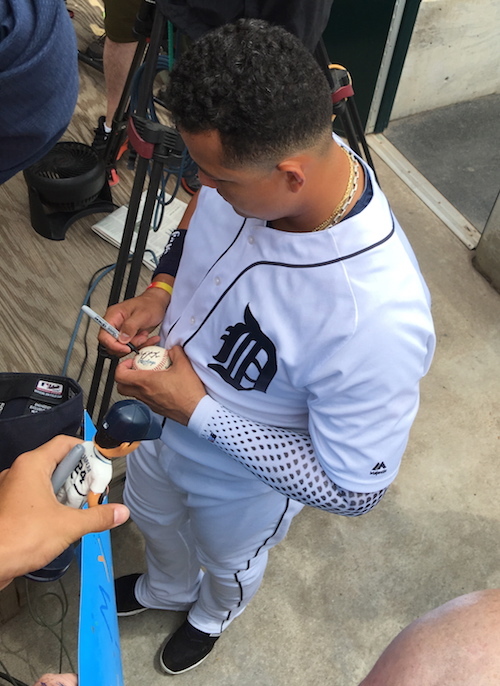 Recently, Lance Martinez from My Detroit Sports captured this original photo of Tigers superstar Miguel Cabrera signing autographs, prior to a game at Comerica Park in Detroit. A Miguel Cabrera autograph signing session is always a huge deal for the hometown fans in the state of Michigan. Cabrera has been one of baseball’s best players, over the past decade. The Venezuela native is a two-time AL MVP, 11-time All-Star and four-time AL batting champion. Cabrera's greatest individual accomplishment was winning his first AL MVP award, upon achieving the Triple Crown in 2012. Going into Thursday, Cabrera has 21 homeruns and 60 runs batted in for the second place 54-48 Tigers. Tigers fans can also check out numerous other iFolloSports.com behind the scenes stories, chronicling Cabrera over the last few years.